„Wenn ich die zwölf wichtigsten zeitgenössischen Komponisten Amerikas aufzählen müsste, dann wäre der Name Jennifer Higdon auf alle Fälle dabei.“ (Musik-Professor Ned Rorem, bei dem Jennifer Higdon das Fach Komposition studierte) Jennifer Higdon zählt im heimischen Amerika zu den größten Talenten im Lager der neuen Klassik-Komponisten. Zu Recht, wie City Scape belegt. Aufgenommen mit dem Atlanta Symphony Orchestra unter der Leitung von Robert Spano, präsentiert die gefeierte Newcomerin das fünfteilige „Concerto For Orchestra“ und das aus drei einzelnen Klanggemälden bestehende „City Scape“, in dem sie der Stadt Atlanta ein beeindruckendes Denkmal setzt. Mit viel Gefühl für Klangfarben, Struktur und einem Gespür für Dramatik, die ohne Überzeichnungen auskommt, schuf Jennifer Higdon moderne großorchestrale Musik, die stilistisch irgendwo zwischen Leonard Bernstein und Philip Glass angesiedelt ist. Das Ergebnis ist atemberaubende, neue amerikanische Klassik, bei der auch rhythmische Elemente eine treibende Rolle spielen. In just two years as music director of the Atlanta Symphony Orchestra (ASO), Robert Spano’s three Telarc recordings with the orchestra have won wide acclaim and three Grammy Awards. now, Telarc will release ASO’s fourth recording, Concerto for Orchestra and City Scape—a CD of two works by one of today’s most sought-after and prolific American composers, Jennifer Higdon. 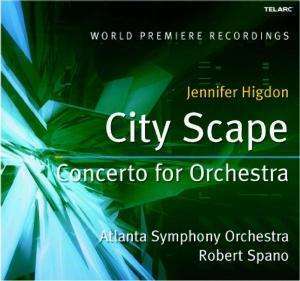 City Scape is the first work commissioned by the Atlanta Symphony Orchestra under the leadership of Robert Spano and was premiered by the orchestra in November 2002. Ms. Higdon, who spent 10 years as a child in Atlanta, describes City Scape as “a musical postcard of the city—a landscape of people, images, and energy.” The score is dedicated to Robert Spano, whom she met 18 years ago when both were at Bowling Green State University in Ohio. He was a faculty member at the time, and she was a student. In February 2003, the Atlanta Symphony Orchestra and Chorus conducted by Robert Spano won three Grammy Awards for their Telarc recording of Ralph Vaughan Williams’s A Sea Symphony in all three categories in which it was nominated: Best Classical Album, Best Choral Album, and Best Engineered Album. Competing in the Best Choral Album category was a second recording by the Atlanta Symphony Orchestra and Chorus: Orff's Carmina burana conducted by the ASO's Principal Guest Conductor Donald Runnicles. Robert Spano’s first Telarc recording with the Atlanta Symphony Orchestra was Rimsky-Korsakov’s Scheherazade and Russian Easter Overture. At the time ClassicsToday. com wrote: “I can’t imagine a more distinguished or musically appealing first release from this exciting new partnership.” Their most recent recording, released this past May, was Rainbow Body, a CD of middle- and late-20th-century American symphony works, which included Jennifer Higdon’s “blue cathedral,” and about which the Los Angeles Times wrote: “Works by four American composers—two familiar, two new—constitute a lustily played program from a resourceful ensemble led by its 42-year-old music director. Christopher Theofanidis’ ‘Rainbow Body’ and Jennifer Higdon’s ‘blue cathedral’ are craftily engaging tone poems in the quarter-hour genre. Theofanidis’ style seems more urban, Higdon’s more pastoral; both ascend Richard Straussian climaxes with ease and use melody skillfully. Spano achieves dramatic sweep and many luscious details in both Barber’s Symphony No. 1 and the Suite from Copland’s ‘Appalachian Spring.’” This recording most recently received a 2003 Grammy nomination for Best Engineered Album and Christopher Theofanidis won the UK’s Masterprize competition for his work. The Atlanta Symphony Orchestra’s long-standing relationship with Telarc has resulted in 21 Grammy Awards. This recording legacy lives on in 2004 with the release of the Berlioz Requiem with the Atlanta Symphony Orchestra and Chorus conducted by Robert Spano. The Atlanta Symphony Orchestra is the largest arts organization in the southeast and one of the youngest American orchestras to achieve international prominence. Now in its 58th season, the orchestra performs year-round in more than 250 concerts, including a 72-concert classical season, an annual pops series, and a full schedule of educational and neighborhood concerts. The orchestra also supports 200 young musicians in the Atlanta Symphony Youth Orchestra and Talent Development programs.